During the 1920’s, women wore red lips, creamy face powder and had skinny eyebrows. 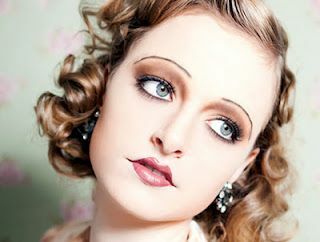 During the 1930’s, skinny eyebrows and red lips were still popular. Another popular look was applying petroleum jelly to their eyelids and eyebrows. Women strived to look as glam as actresses like Greta Garbo despite the Great Depression. During the 1940’s, pin up girls were trendy so that meant for thicker, arched eyebrows, red lips, black winged eyeliner, and natural tones on the eyes. During the 1950’s, women’s makeup was usually simple and fresh-faced with thin black eyeliner and bright matte red lips. Eye and cheek makeup were natural but foundation was really packed on. During the 1960’s, there were two different types of makeup: the mod look and the hippie look. Mod makeup was more heavier because of the bright eyeshadows, heavy dark eyeliner, false eyelashes and pale colored lips. The hippie look was often natural and bare-faced. If they did wear makeup, it was usually mascara and a clear gloss or pale lip color. During the 1970’s, women wore pale, metallic eyeshadows and glossy lipsticks. Color was a major factor in makeup. During the 1980’s, makeup was strong and matte. Foundation, powder and lips were usually matte. The eyes were heavily defined with a smoky eyeshadow look, cheeks were contoured and lips were bold and dark. During the 1990’s, there were three different makeup looks. Some wore a grunge look that was defined with heavy black eyeliner, red or dark metallic lipstick, and sometimes glitter on the eye, cheek and lips. Those that opted for a neutral look wore neutral tones, such as pinks and browns, on their eyelids and lips. For an evening look, they would switch out their neutral color lipstick for a deep red lipstick. The third makeup look was a bare-faced look that required moisturizer, clear mascara, and sometimes concealer, blush, white eyeliner or cream foundation on the eyelids. Makeup today continues to change and sometimes old trends make its way back to today.